24th April 2018, New Delhi: The dependency of Indian consumers on ecommerce sites is gradually increasing. Combined with convenience, these ecommerce sites provide consumers with choice as well as discounted prices – all these from the comfort of their homes. But lately, many complaints of counterfeit or fake products being sold on ecommerce sites have been reported by consumers. According to consumers, sellers list counterfeit products on these eCommerce sites at heavily discounted prices to gain the attention of customers. In the race to advertise highest discounts, most eCommerce sites only do basic checks on sellers and don’t really perform the detailed due diligence. Many ecommerce sites in fact offer cashback schemes and additional quantity and threshold discounts to lure the consumer to shop more and finally somewhere in this process the consumer ends up shopping for a product that us counterfeit. To know the consumer view on this issue, LocalCircles conducted a large survey which received more than 30,000 votes and over 12,000 unique consumers from across India participated in the exercise. 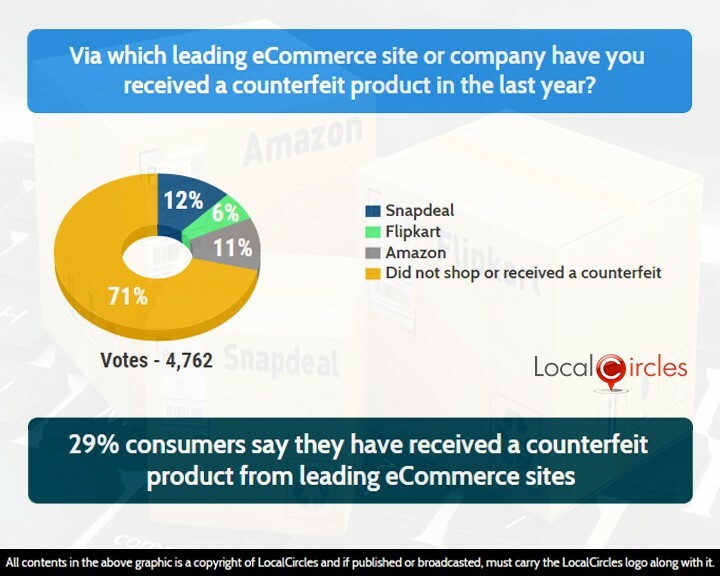 38% consumers in the first poll said that they have received a counterfeit product from an ecommerce site in the last one year. 45% said this has never happened to them while 17% were unsure about it. 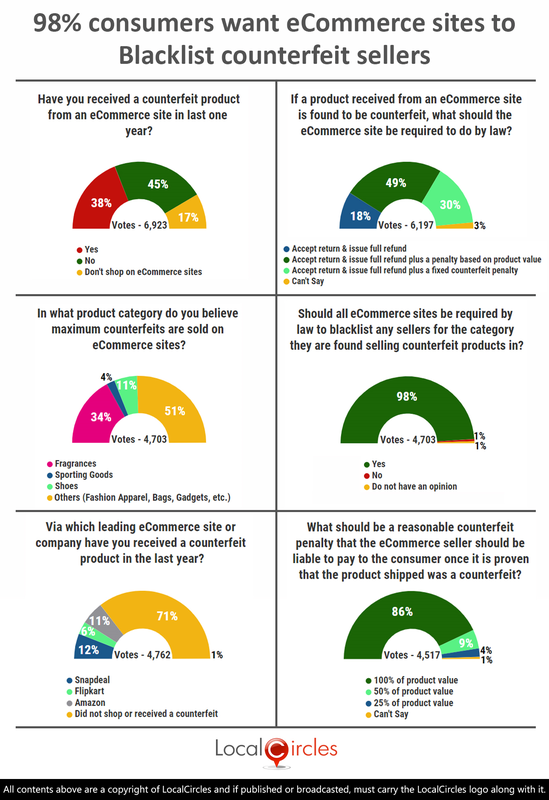 The second question asked consumers via which leading ecommerce site have they received a counterfeit product in the last year. In response, 12% said Snapdeal, 11% said Amazon and 6% said Flipkart. 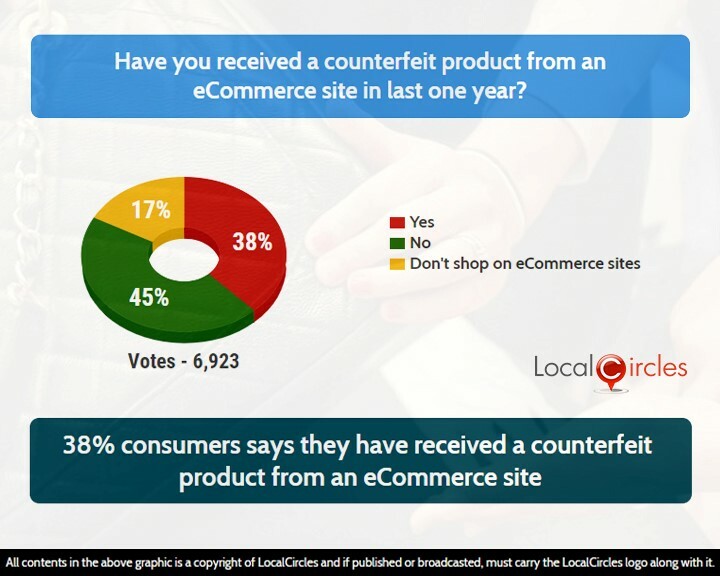 71% said they either did not shop online or did not receive a counterfeit product. Recently, Skechers, an American footwear brand dragged e-commerce site Flipkart and four of its seller to court for allegedly selling its counterfeit products. As per media reports, raids were later conducted in various seller warehouses in Delhi and Ahmedabad and more than 15,000 pair of fake Skechers shoes were found. 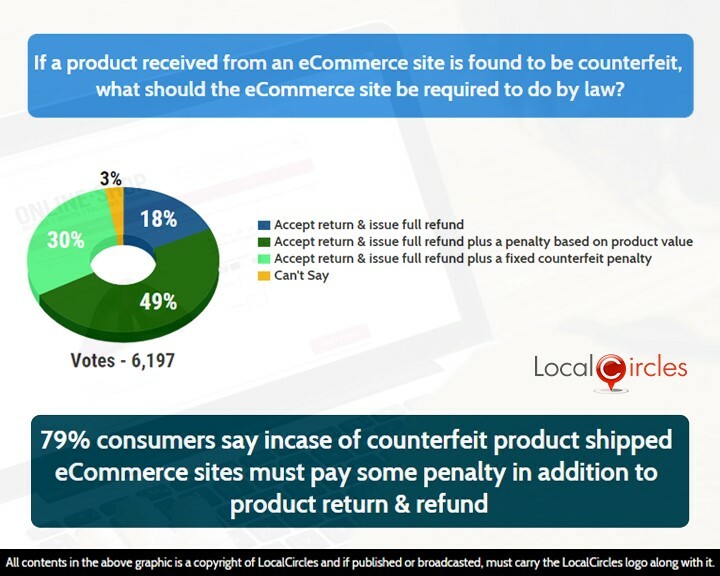 The third question asked what the ecommerce sites should be required to do by law if a product received from their site is found to be counterfeit. 49% said they should accept return and issue a full refund plus a penalty based on the product value. 30% said they should accept return and issue a full refund plus a fixed counterfeit penalty. 18% said ecommerce sites should just accept return and issue a full refund while 3% consumers were unsure about what should be done. The counterfeit products shipped via ecommerce sites do not match the quality standards of the original products. This in turn, brings bad publicity to the brand eventually affecting their sales numbers. 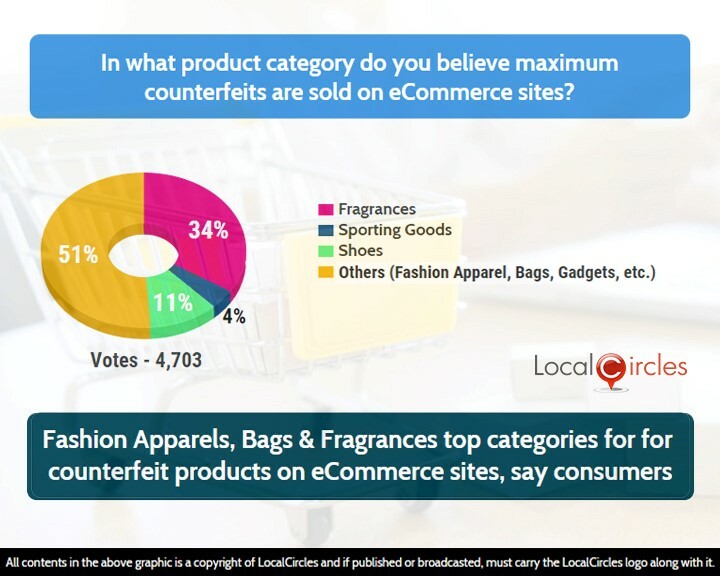 In the following question, 34% consumers identified perfumes and other fragrances as the top category for counterfeit products on ecommerce sites. 11% identified it as shoes, 4% as sporting goods and 51% said others (fashion apparels, bags, gadgets etc.). The Delhi High Court had previously banned a seller from using the name L'Oreal on any of its products sold on ShopClues.com, after it was reported by consumers for selling fake L’Oreal products on the site. 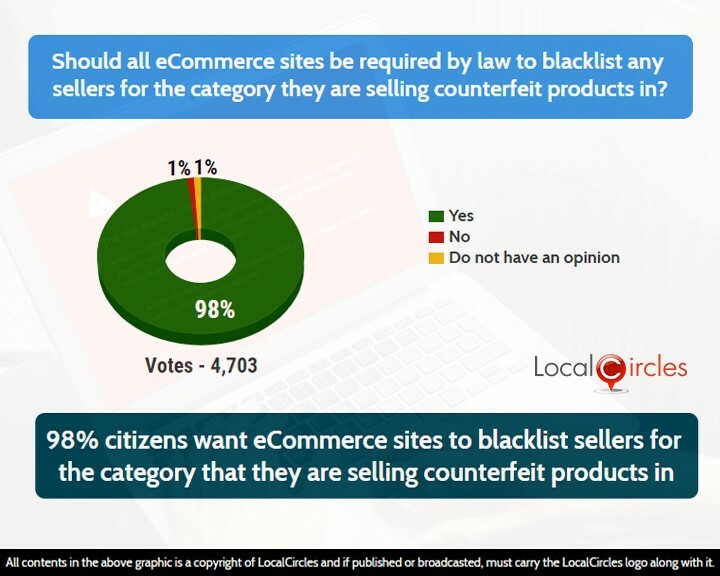 The next question asked consumers if all ecommerce companies should be required by law to blacklist any seller for the category they are selling counterfeit products in. 98% respondents replied in a ‘yes’. This is a reasonable ask that the consumers feel must be implemented by the Government. Such a rule will reasonably penalise seller as the eCommerce site will be required to only bar them from that particular category where they were found selling counterfeit products while still allowing them to sell in other categories. Paytm Mall, in mid-2017 had delisted over 85,000 sellers, in an effort to block fraudulent sellers from signing up on their platform. Flipkart in past has said it removes counterfeit items from its platforms regularly and has a ‘zero tolerance policy’ for counterfeit goods. 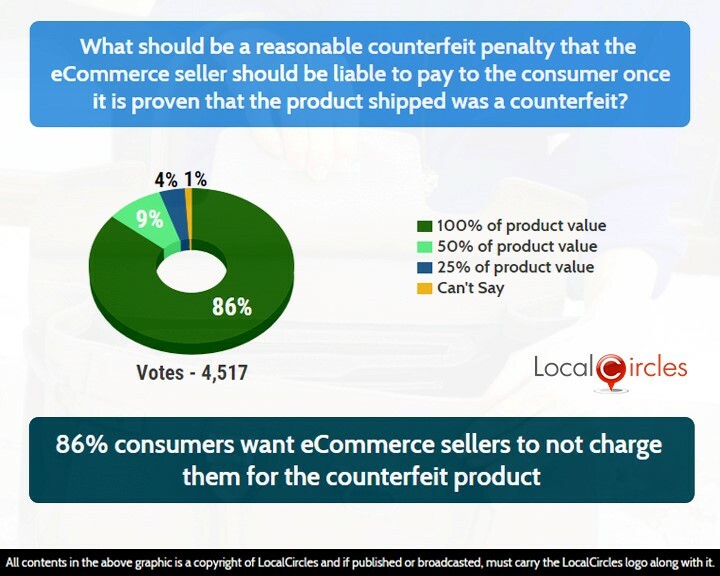 The last question asked what should be the reasonable counterfeit penalty that the ecommerce sellers should be liable to pay to the consumer once it is proven that the product shipped was a counterfeit. 86% said it should be 100% of the product value, 9% said it should 50% of the product value and 4% said it should be 25% of product value. Most of the consumers are of the opinion that if a counterfeit product is delivered to them, then they should be refunded their entire money and at the same time, also asked to keep the product with them. Globally, top retailers such as Alibaba, Amazon and eBay have also struggled to weed out counterfeits and second-hand products. Counterfeit product selling is a big business worldwide amounting to almost $500 billion annually. Ecommerce platforms are realizing the problems and some of them have even taken steps to identify and remove counterfeit product listings. While many experts have predicted that India’s e-commerce market will touch $100 billion in the next 10 years, the ecommerce sites, the regulator and the consumers will have to work in-sync to fight the demon of counterfeit goods. Some of the consumers on the platform have also raised a strong concern suggesting that some eCommerce sites not only tend to ignore counterfeit sellers but promote such sellers as it allows them to offer the big discounts. Genuine products of international brands cannot afford to be sold at 50-80% off, according to some consumers. A few consumers have also suggested that the Government look at a conflict of interest relationship between the ecommerce site and the counterfeit seller where the ecommerce site may have made an investment in the seller and is knowingly let such sellers sell on the platform. 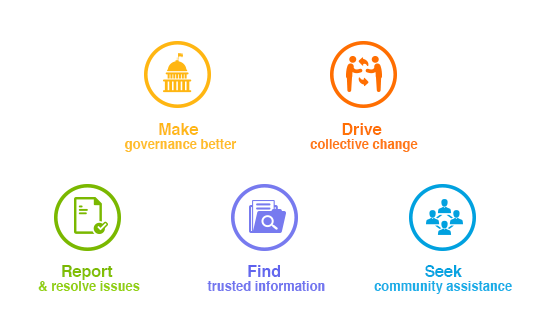 LocalCircles will escalate all such consumer complaints received to the Department of Consumer Affairs and other Government departments based on their nature.